Awesome Friday! » Blog Archive The Legend of Korra - Episode 3.08 and Other News - Awesome Friday! “Change” has turned out to be an apt name for this season. At Comic-Con, Nick announced that the show would be pulled from the network after episode 3.08; the remainder of the series will be airing on various digital sources, including Nickelodeon.com, at a weekly cadence on Fridays at 12:00 PM EST. I’ll ramble about this move in a bit, but first, it’s time for an episode recap and a few theories! 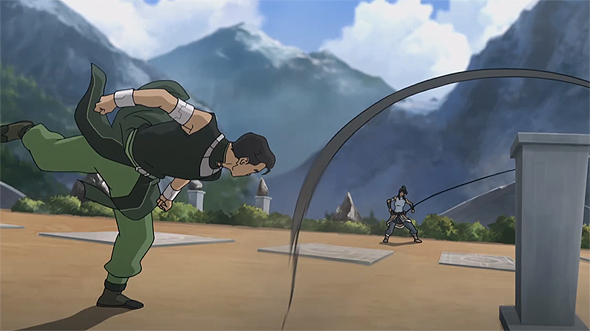 In Zaofu, Korra is taking well to metalbending, but Bolin can’t seem to get the hang of it. After a farewell dinner, Opal leaves to train with Tenzin. 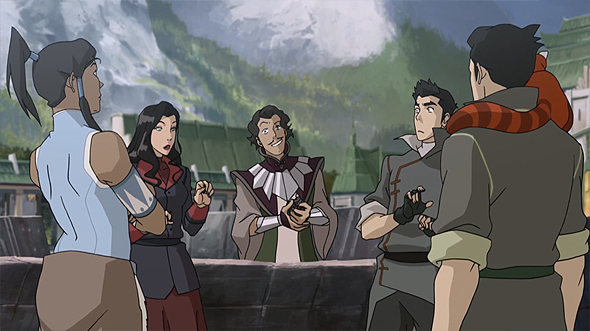 Team Avatar (Korra, Mako, Bolin and Asami) + Lin spend one last night in the metal city, planning to leave the next day to seek out more airbenders. 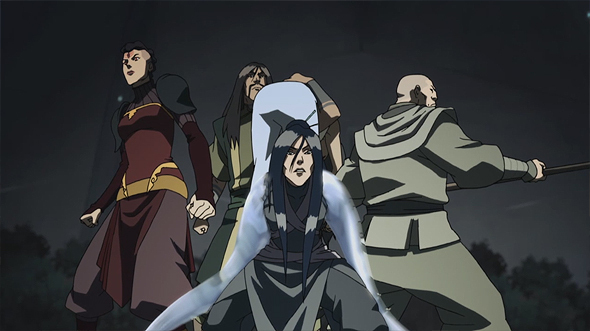 The guards lock down Zaofu for the night, bending the protective metal covers into place over the city, but Zaheer and his group are already inside the city. They drug Korra and try to carry her off. What ensues is an epic bending showdown, with the four villains on one side, and Team Avatar, Lin, Suyin and the Zaofu guards on the other. The animation and choreography for this sequence are, like previous fight sequences this season, top-notch, with careful detail put into every hand gesture and movement, and every bender taking part. (Asami, sadly, doesn’t really have a role to play in this fight.) The characters are resourceful and make good use of their environments. The pacing is tense, yet easy to follow. I cannot say enough good things about the action sequences so far this season. After a solid team effort (including a nail-biting precision shot by Bolin), the group succeeds in rescuing Korra…but Zaheer and the gang escape, an impressive task considering the city is on lockdown — they must have a friend on the inside. Lin, Suyin and her advisor, Aiwei, question all the guards. Aiwei has perfected the art of telling truth from lies by reading the vibrations given off by a person’s body, and he identifies one of the guards as a suspect. A search of the guard’s apartment turns up evidence that he aided the fugitives, but Mako isn’t convinced. Varrick overhears his concerns, and points out that the situation is similar to the time he planted evidence in Mako’s apartment to get him arrested (in Book 2). And so, a suspicious Team Avatar heads to Aiwei’s house, where they uncover a secret tunnel. Before they can investigate, however, Aiwei appears. Seeing they’ve figured him out, he escapes, leaving a bomb in his wake — one that would have taken out our heroes, if not for some quick protective airbending by Korra. Korra wants to chase down Aiwei, but Lin wants her back in Republic City so she can be protected from Zaheer and friends. 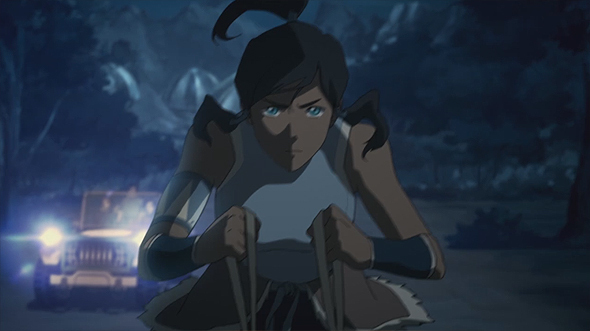 Korra reluctantly agrees, but Suyin, going behind Lin’s back, gives her a jeep loaded with supplies. 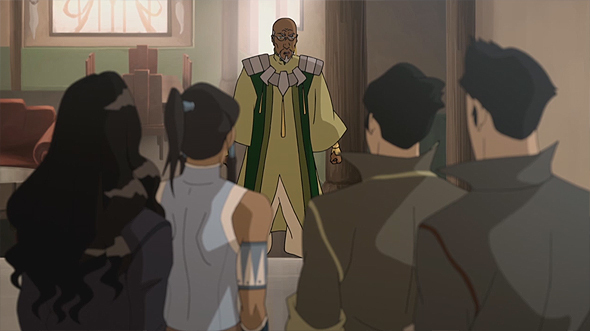 As the episode ends, Team Avatar leaves to track down Aiwei. Can I say one more time that I loved the bending showdown? I’m still not sure why our villains are after Korra, and I’m intrigued to find out. They seem as if they’ll be tricky to defeat. I wonder if all the two main threads this season will intertwine, with Tenzin’s airbenders playing a role in the ultimate showdown. There was potential foreshadowing during the showdown; Bolin expressed awe at Ghazan’s lavabending. A popular theory floating around online is that Bolin is struggling with metalbending because he’s actually a lavabender. I’ll be crossing my fingers that this theory is accurate. Otherwise, I don’t have all that many theories this season — the story is compelling enough that I’m content to sit back and enjoy the ride. If you have a few theories of your own, please feel free to share in the comments section below! Now, let’s talk about the move to digital streaming. The move isn’t a huge surprise, especially after the digital experiment they did with the season finale of Book 2 (where the last two episodes were available online a full week before they aired on the network.) Korra has always pulled in far higher viewing numbers online than it ever did on TV. Personally, I’m a fan of TV stations moving to digital releases. In this age of Netflix, Crunchyroll and other streaming services, the old TV model is in need of an overhaul. Even ignoring the convenience factor for viewers, there are a lot of perks to digital streaming. For one thing, digital content is easily (and legally) accessible to the growing number of people who don’t have cable TV. For another, digital content offers exact viewer numbers, which is a big step up from the outdated ratings system currently in place for TV shows. My gut says the numbers will particularly improve for the late teens/early twenties crowd, which incidentally fall within Korra’s target demographic. I do, however, have some concerns about Korra carrying this transition on its shoulders, especially halfway through the season. I can’t help but wonder if the plan was to release the entire book digitally, but that leak forced Nick to air part of the season for weird contractual reasons. Or is Nick just hoping people will be so addicted to the season that they’ll follow it to the website? Either way, it feels like a strange move. Regardless, I’m excited to see how this plays out. I just hope there won’t be accessibility issues for viewers outside the US. I suppose we’ll see on Friday! Here’s hoping it rolls out with relatively few hiccups. How do you feel about this move? Excited? Nervous? Angry? Sound off in the comments below! The action sequences in this episode were pretty superb. I don’t know if they’re going to make Bolin a lava bender (that’d be awesome) but I do hope they do more with his sharp shooting. Maybe he gets amazing at bending earth into small projectiles and then hitting precise targets with them. That would be it’s own form of awesome too. Also, Asami needs more to do, no? I really feel like the writers have been lost about what to do with Asami every since…well…they decided not to turn her evil in Book One. It’s unfortunate. I really like her, but she’s kind of the group chauffeur right now. Yeah, we ended up having to do jiggery-pokery to make it work, sadly. I wonder if that means our views even count? I have no idea how their telemetry works. I hope it counted.